Festival of the Spoken Nerd – or, broken down into its constituent parts, Helen Arney, Steve Mould and Matt Parker – is a monthly comedy night based around a science / tech theme with special guests. It's been a hugely deserved hit and comes to the first direct Dialogue festival, twice, on Thursday 3 November. We were itching to talk to them about FOTSN and maybe ask them if, as friends of science, they could recommend a cream for that. FOTSN is a regular sell-out way in advance: did you ever imagine science and comedy would be so popular? Helen: It already was when we started! We met because we were in three different "geeky" comedy shows at the Edinburgh Fringe last year. It seemed obvious for us to start a sci-curious comedy night together. Steve: What we didn't know was whether anyone would go for our take on it, so we work really hard to make every FOTSN special. There's a new theme and different guests every time, so people keep coming back because each show is totally unique. Matt: We were always suspicious there was a "closet nerd" population out there who enjoyed science and maths at school - maybe did a degree - and now miss that celebration of all things geeky. Thankfully they do exist and have found our show! What can we expect from FOTSN at dialogue? You're doing two shows at dialogue - will they be the same? Or is there a 9 o'clock watershed? Helen: Both shows clash with different events at the festival - so at the first show we're expecting all Josie and Rich's fans to pop by, and at the second one we'll hopefully blow the minds of some fans of Aisle 16's stand-up poetry. Steve: Also, Matt will count the number of swear words in each show and if they don't add up to a prime number he'll get very upset. This is normal. Who would be your dream FOTSN guest(s)? Steve: Richard Feynman - an amazing science communicator. Look him up on youtube, it's glorious. Helen: Especially the footage of him playing the bongos. Where can we see you when you're not FOTSNing? 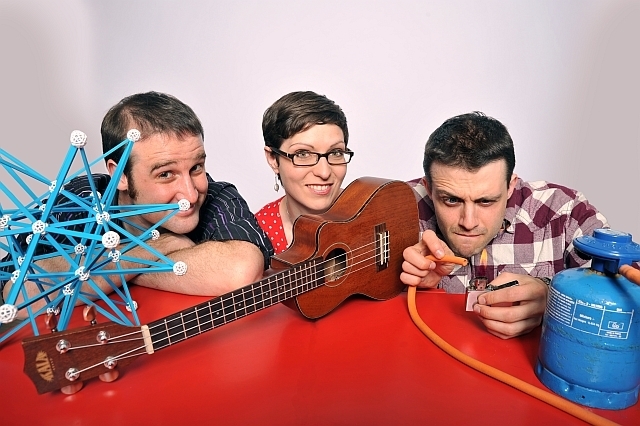 Helen: You can find me singing about science on the national Uncaged Monkeys tour with Robin Ince and Brian Cox in December, or find my songs and videos at http://helenarney.com. Steve: When I'm not FOTSNing I'm Guerilla Science-ing. We mix science with art, music and play. And we do it in unexpected places like music festivals. Matt: I'll soon be found on tour with Your Days are Numbered or ranting about maths in the Guardian. And we're all on Twitter, as ourselves and @fotsn. What's your top nerd London tip? Helen: Science Museum Lates. Once a month they install a bar next to the hands-on science bit and you get to play with all the interactive experiments. No longer do little kids get all the fun! Steve: The Way Out Tube Map - available from Amazon. It tells you which carriage to get on so that you're right opposite the platform exit when you arrive. This nerd likes to be super efficient. Helen: I've got the same thing as a smartphone app. This nerd's handbag has micropower. Festival of the Spoken Nerd is on at 8pm and 9.30pm, 3 November at the Earl of Portobello, 36 Golborne Road W10. The next Festival of the Spoken Nerd show at their usual home, the New Red Lion Theatre, that isn't sold out is 12th December. We said it was popular... Read our preview of the rest of the first direct Dialogue festival.